Big Sur camping ranges from primitive to full hookups. Some campgrounds are near the ocean or have ocean views. Others are inland, surrounded by trees. The descriptions below will help you find the place that's right for you. The photo above was taken from a campsite called Prewitt Ridge, above Big Sur in the Los Padres National Forest. It's not a campground, just a few beautiful spots to pitch your tent. If you want to go there, an online search will turn up lots of resources to help you find it. Most of the campgrounds below take reservations and Big Sur is a popular place to go. Try to make your reservations as far ahead of time as you can. There are 24 sites in this campground. They're located in an open meadow with a maximum of four people per site. It's a primitive, hike-in campsite, about 1/3 mile from the parking area. No reservations are required, and sites are available on a first come, first served basis. This privately-owned campground has cabins with fireplaces and kitchens. They also have sites for tents and RVs with hookups. It's located next to the Big Sur River under the trees. Most visitors like it, but a few complain that it's too expensive. This primitive campground operated by the US Forest Service is eight miles inland. To get there, you'll drive up a narrow and often bumpy road. It has 12 spaces and is suitable for tents and camping trailers. Vault toilets are provided, but that's all. Fernwood has cabins, tent, and RV camping and even some tent cabins. It's in a lovely spot on the Big Sur River, with a restaurant on site. Visitors like it and talk about how beautiful the surroundings are. Kirk Creek has 34 sites in the Los Padres National Forest, overlooking the ocean. RVs are permitted, but they don't have hookups, and the nearest dump station is 35-40 miles away. There's no water available in the campground, but it does have vault toilets. You can reserve sites at Kirk Creek on recreation.gov. Limekiln has 33 campsites in a beautiful Big Sur location. It can accommodate trailers up to 15 feet long and RVs up to 24 feet. Some of the sites overlook the ocean, but others are in the redwood trees. Like most state parks, reservations are available six months ahead of time and sell out fast. Reserve your camping spot as early as you can at Reserve California. Pfeiffer Big Sur has more than 170 campsites. It can accommodate trailers up to 27 feet long and RVs up to 32 feet. There's a dump station, and some sites have water taps, but no other hookups. It has several sites for tents only. Like most state parks, reservations are available six months ahead of time and sell out fast. Reserve your camping spot as early as you can at Reserve California. When the campground is full, en route camping may be available if your vehicle has an onboard flush toilet. Plaskett Creek is a US Forest Service campground with family campsites in a park-like setting. It is open to both tent and RV camping. Less primitive than many Forest Service campgrounds, it has flush toilets, sinks, and drinking water throughout the campground. You can reserve a spot at Reserve California. This privately-owned campground has 40 sites for tents and RVs - and 12 cabins. 20amp electricity and water hook-ups are available. They have hot showers, laundry facilities, and restrooms. It's spread over 10 acres along the Big Sur River. Their luxury yurts are technically a tent (they have canvas sides), so we're calling it a campground. It's more like a resort with a dining room and spa. 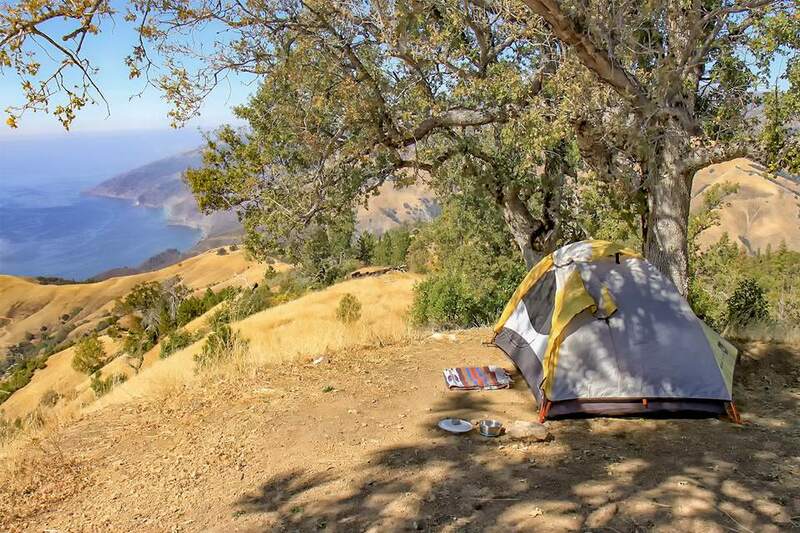 They also have an ocean view, walk-in campsites where you can pitch your tent - or rent one of theirs. This campground is in a beautiful box canyon with a stream flowing through a grove of redwoods. It's a tent-only campground, but they can also accommodate camper vans and trucks with roof tents or small campers on top (no longer than 22 feet). You may also want to check hotel and cabin options for your place to stay. If you want to do more than just hang around the campground, there are plenty of things to do in Big Sur, including hiking, going to the beach, and visiting the local lighthouse.